Admission: FCC members: free; non-members 50 RMB. 25-30 rmb drink specials to be offered! Statistically, zero percent of the Chinese population plays golf, still known as the “rich man’s game” and considered politically taboo. Yet China is in the midst of a golf boom — hundreds of new courses have opened in the past decade, despite it being illegal for anyone to build them. 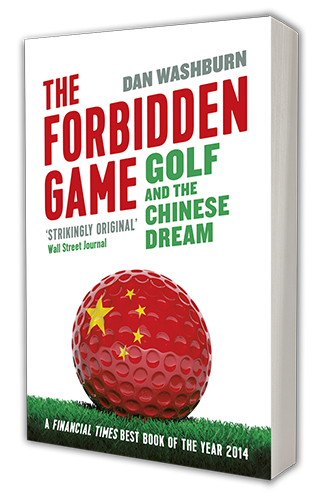 In his new book, The Forbidden Game: Golf and the Chinese Dream, award-winning journalist Dan Washburn charts a vivid path through this contradictory country by following the lives of three men intimately involved in China’s bizarre golf scene. The former Shanghai-based writer and Shanghaiist founder will discuss the reporting that went into his critically acclaimed book — described as “strikingly original” by The Wall Street Journal and “gripping” by The Economist — and how it almost never got published. Dan Washburn is an award-winning journalist and Chief Content Officer at the Asia Society. His writing has appeared in FT Weekend Magazine, Slate, Foreign Policy, The Atlantic, The Economist, Golf World, Golf Digest, ESPN.com, the South China Morning Post, and other publications. His work has been featured in the anthologies Unsavory Elements: Stories of Foreigners on the Loose in China and Inside the Ropes: Sportswriters Get Their Game On. Dan is also the founding editor of Shanghaiist.com, one of the most widely read English-language websites about China. After almost a decade in China, he now lives in Brooklyn, New York. Visit him online at http://danwashburn.com.